A man climbed over a security barrier on the south side of the White House complex Monday afternoon, according to the U.S. Secret Service. The incident took place about 12:45 p.m. between the Ellipse and E Street. Jim Tripp, a tourist from Washington state, caught some of the incident on cellphone video. "We were just here taking pictures in front of the White House with tons of other people, and some guy came at me kind of from my blind spot and just very calmly walked up and looked and me and said, 'Hey, do you want to see if God's real?' and he threw a backpack down at my feet in front of me, and I kind of looked up, and then he jumped over the three barriers that are there, ran across the street and started climbing the fence in front of the White House," Tripp said. "So at that time I turned on the video and started videotaping him." The man had climbed over the rail separating E Street and the Ellipse Park roadway, ignoring signs reading "Restricted Area," and ran across E Street, authorities said. 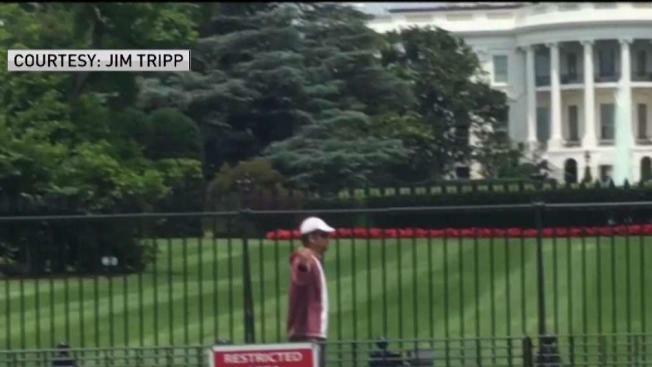 He climbed over the shorter chain fence along the south fence line of the White House complex. Secret Service officers yelled "stop" and "get on the ground" and took him into custody. D.C. police deemed the backpack was safe. Alexander Thomas Miner, 29, of no fixed address, is in D.C. police custody and is charged with unlawful entry. The Ellipse was closed for a time, a Secret Service spokesperson said. Pedestrian and vehicle traffic on E Street and the White House fence line was restricted.